Tropical Storm Manuel, which has battered the south-west of Mexico, has gathered strength and is now a category one hurricane, US meteorologists say. Hurricane Manuel is now approaching north-western Mexico and threatens more destruction, the US National Hurricane Centre said. 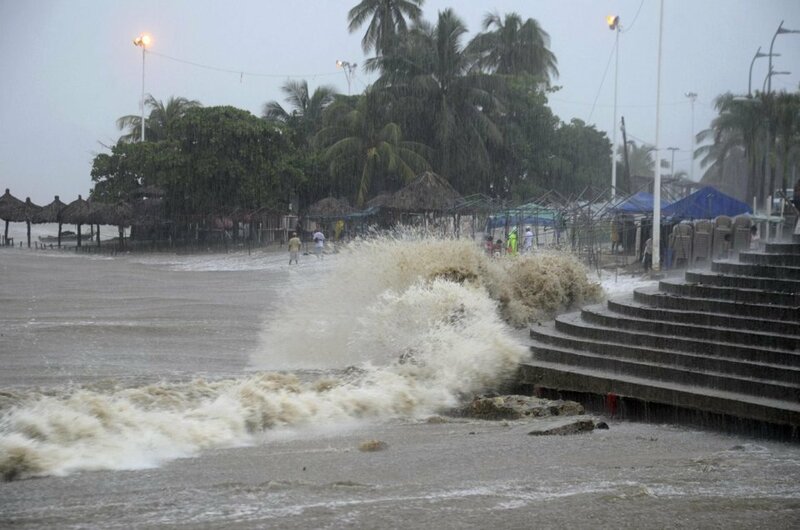 The tropical storms Ingrid and Manuel killed 80 people earlier this week. Now 58 people are reported missing after a landslide buried a village in the south-west of the country. US experts say Hurricane Manuel is sustaining winds of 75mph and moving towards the coast. Mexican President Enrique Pena Nieto said that 58 people were missing after the landslide in the village of La Pintada in Guerrero state. “It doesn’t look good, based on the photos we have in our possession,” said Mexican Interior Minister Miguel Angel Osorio Chong, saying it was a “very powerful” landslide. “Up to this point, we do not have any [confirmed] dead in the landslide,” he added. Tens of thousands of tourists, cut off by landslides caused by Manuel, are still being transported out of the Mexican resort of Acapulco. More than 2,000 tourists have been airlifted from the Air Base Seven military facility north of the resort. Since the weekend, passengers have been stranded in hotels and at Acapulco’s international airport, where water flooded the terminal. Manuel was almost immediately followed by Hurricane Ingrid, causing widespread devastation in the east of the country. It was the first time since 1958 that two powerful storms hit Mexico within 24 hours. Main roads out of Acapulco have been blocked by landslips, leaving tourists and local residents stranded in the city and along Mexico’s west coast. At Air Base Seven, soldiers guarded families who waited for hours outside the base until they were allowed to board one of the few aircraft which would take them to Mexico City. In Acapulco, passengers were being taken directly from shelters to the runway because the main airport terminal remained closed. There are fears that remote hillside communities may be particularly affected.